I couldn’t make A-Day. I haven’t made A-Day for years, because the vagaries of geography and child care have been many. Some of those years it hurts–borderline physically–to watch on TV. Most years the previous season’s starters have their few series, the usual Gus play-calls are aired out after a couple months in the closet, whatever nuggets of knowledge are gleaned are of minimal value (if they’re trustworthy at all), and despite the ache of not being on the Plains, I can make my peace with it. 2017’s A-Day fell in the painful category. 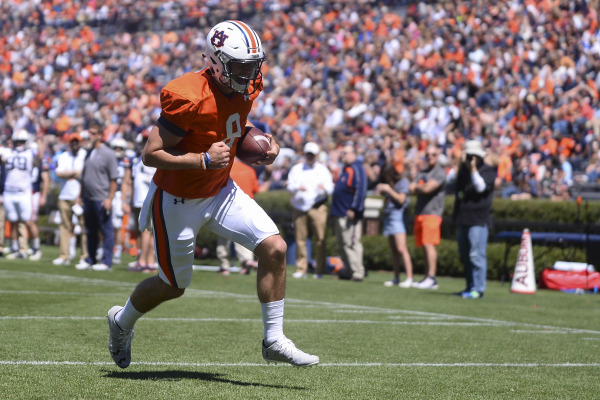 I saw the same Jarrett Stidham we all saw: the sort of potentially game-breaking pocket-bound artillery weapon we haven’t enjoyed at Auburn since at least Jason Campbell’s senior season, and arguably much longer than that. I saw an offensive performance more revelatory than any at A-Day since 2009, with Stidham washing away the grime of the past two seasons’ quarterbacking woes as cleanly as Onterrio McCalebb dashing for long-distance touchdowns behind an unleashed Ziemba-Pugh-Berry-Isom washed away the late Tuberville era eight years ago. I saw a team I want to see again, now. If I’m a fan of a rival SEC school, yeah, I’m probably having a laugh over Auburn fans losing our collective grip over 20 Stidham passes just two years removed from “Jeremy Johnson will be better than Nick Marshall” mania. It’s worth remembering that Johnson’s first-half showing against Arkansas to open the 2014 season was far more meaningful — and should have been far more predictive — than anything Stidham did Saturday. Ron Howard voice: It wasn’t. Stidham’s arrival solves both at a stroke. It’s his offense; you know it, I know, Chip Lindsey knows it, poor Sean White knows it. And if at some point injury means it’s not, White gets to show once more why it should have been his offense from the jump in 2016. With those issues behind the Tigers … how much do the ones in front of them matter? A Stidham that goes a mere 13-for-20 and needs a window larger than the picture frame on your office desk would have been enough to make Auburn one of the 10 best teams in the country last fall. So what does the shoulda-gone-19-for-20 version do for them? Especially if the running back depth holds up (it should), if Craig-Myers leads the continued development for the sophomore pack at receiver (he should), and any post-Lawson/Adams step back from the defense is minor (it should be)? I don’t know. But after Saturday, the five months I have to wait to find out are suddenly 4.8 too many. Butch Thompson’s bunch just lost its first series of the season. That’s too bad. It’s also April 10. They’ve already played series against Florida and South Carolina. So that’s not so bad at all — particularly considering Keegan Thompson didn’t yet appear to be himself in his College Station start. If Thompson can put his tendonitis behind him, Auburn will go into the postseason with two ace-level pitchers and a third in Davis Daniel who’s more-than-capable of providing a quality start against high-level competition. Add in the possibility of playing host to their regional, and that’s a lot of reason for postseason confidence. But this Auburn baseball season is about more than this season — it’s about Thompson not even needing two full years to prove himself precisely the hire we thought he was. Sure, Slater, Pawlowski and Golloway all made a regional (Pawlowski’s 2010 team even hosted), but none made this kind of impact on the program this fast, especially in the exact area — viz. pitching depth, in Thompson’s case — where they’d been hired to provide it. Maybe the foundation Thompson’s built isn’t as solid as it appears to be (and if it wasn’t, I wouldn’t be the person to ask when it comes to baseball), but watching the South Carolina series, it was impossible not to feel like this is the season Auburn baseball finally walks out of the wilderness for good. But on the other … this is Auburn softball, the program that’s made its three-season ascension by not so much embracing drama as giving drama a 2-karat ring and asking if drama’s ready to move in together. Remember: the 2016 team entered its final regular season game having lost four straight, three by seven runs or more. Then it won that game, won the SEC tournament, and came within a run of the national championship. So, given that Kaylee Carlson’s a legitimate ace … that they’re No. 2 in the RPI … that if they don’t make back-to-back errors with two out in the bottom of the 7th, they take two of three from the Gators in Gainesville … that Alyssa Rivera will save us all … that it will still take a substantial collapse to prevent them from hosting a super regional … yeah, things here are still awfully, awfully, awfully good. By the time that infuriating loss to Missouri in Nashville brought the curtain down on the Tigers’ infuriating end to the season, a portion of Auburn fans seemed more frustrated with than appreciative of the 2016-2017 team, and I (kinda) get it. When you haven’t tasted the postseason in eight years, and the only thing standing in your way is not blowing a 23-point second half lead, or beating a Georgia team without Yante Maten, or not stubbing your toe against the SEC’s worst team to open the league tournament, well, it’s not possible to feel like something wasn’t left on the table. That goes double when the tournament you missed out on awards its championship to a team you beat on the road. And it goes triple when so much of the team’s failures come back to a single glaring issue — viz. second-half defense — the coaching staff is both hyper-aware of and seemingly unable to repair. No, the last month-plus of the season was not fun. But that might be the last time we write “not fun” and this program into the same sentence for a while. It might be easier to build Rome in a day than rebuild Auburn men’s basketball in a single offseason, but Bruce Pearl came as close as anyone’s likely to, going from 15-20 (4-14) to 11-20 (5-13) to 18-14 (7-11) in win-loss, from 139 to 189 to 82 in Kenpom. No one in the SEC outdid Pomeroy’s preseason projections more than Auburn did. And I don’t have to tell you the best part: that Pearl pulled this off starting three freshmen, one player younger than “freshman,” and a grand total of four upperclassmen in the entire 11-man season-long rotation. Per Kenpom, the Tigers ranked 332nd in DI experience and 321st in continuity — and still had their best season since Vot Barber was owning fools. Harper/Heron/Purifoy/Wiley return as a foursome, with the candidates for your new starter either Georgia’s state champion Mr. Basketball at the 4 (letting Purifoy dominate smaller players at the 3), Bryce Brown (adding some much needed deep shooting) or a former 20-point scorer in the Big South. Hell, you could try Horace Spencer at the 4 for maximum shot-alteration. You’d still have Anfernee McLemore on the bench. It’s possible Davion Mitchell isn’t going to settle for bench minutes, either. Assuming Spencer’s engaged and Murray’s as good as advertised, Auburn will run 10 SEC-caliber players deep next season, or approximately 6 or 7 more than they have for most of the past decade. In short: this is 100 percent, hands-down, no-questions-asked the best shape this program has been in since the Marquis Daniels era, and maybe longer than that. If you can’t get excited about that because the handful of close wins that went around early in the Tigers’ season came around late in it, you perhaps have a curious relationship with Auburn basketball. Nonetheless, whatever things look like going forward, however close they came to sliding off the bubble, that the Tigers have made back-to-back NCAAs for just the second time since 1999 and 2000 (and the first without a first-team All-WNBA player on the roster) is more than worth celebrating. Coach Flo has work to do. But she’s already been doing work for a while. SO: soak up that sunshine this spring, Auburn fans. There’s a lot of it out there. And the guess here is there’s going to be even more to warm us going forward. *I realize I’m giving gymnastics short shrift by using the “team sport” rubric, and of course from a national perspective various sports — men’s lacrosse, men’s hockey, perhaps both genders of soccer — would arguably rank directly alongside softball. But I’m standing by my statement; among team sports, there’s these five sports in the SEC, and then there’s the rest.